Meet the Cavan man in Saudi Arabia leading the biggest explosion of GAA on the planet - new Middle East GAA Chairperson Patrick Moynagh. The remarkable story of the GAA in the Middle East continues as Bahrain breaks the 1000 player barrier. County captains from Ireland have joined up with GAA clubs in the Middle East at the start of another exciting season in the Gulf. Here is a one-minute explanation of what is the most exciting and spectacular explosion of gaelic games anywhere on the planet - the Middle East League. âLadies have always played second fiddle and this year I put them as the last Final of the Championship as a thank you to what they have brought to the Middle East. 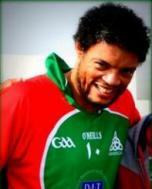 I think the Ladies are the heartbeat of the communityâ - Abu Dhabi Na Fianna Chairperson Tadhg Flahive. See match highlights from the 2016 Sperrin Metal Middle East Championship Final played on Friday April 22 in the Zayed Sports City in Abu Dhabi. See extended match highlights, including every score in the game, from the 2016 Sperrin Metal Middle East GAA Senior Mens Football Championship Final. We preview the first ever GAA World Games in Abu Dhabi on March 6/7 and talk to players, coaches and members of the Middle East County Board as they prepare for the historic event. GAAGO went behind-the-scenes at the launch of the first ever GAA World Games at Croke Park. www.sponsorto.org/project/seleccion-galeÂ­ga-ao-mundial Promotional clip for the project of crowdfunding of the Galician National Teams of Gaelic Football. Video promocional para o proxecto de financiaciÃ³n das SeleciÃ³ns Nacionais Galegas de FÃºtbol GaÃ©lico. The GAA and Etihad Airways are delighted to confirm details of the first ever GAA World Games in Abu Dhabi, UAE next March. The festival of Gaelic Games will feature all of the GAAâs codes, other Irish cultural events and will involve teams from around the globe playing over the course of a weekend. Lets all play the Arabian Way! Gathering Hurling Div 2 final - Middle East V Canada.